Polystyrene, often abbreviated as PS, is a plastic that is naturally transparent when it is developed. It is used in all types of applications, both as a solid material to be used with larger systems and as a foam material that can be applied in a number of different industries. It first became popular in 1941, when it was marketed as a styrofoam product used in practical everyday applications. Though the thermoplastic is most widely recognized in its foam variety, there are several different types of polystyrene that can be used in different ways. Differentiating between the varying types of polystyrene is important because there is controversy that surrounds the material’s use. The material is seen as problematic by environmental groups because it is relatively slow to biodegrade and littering results in a prevalent presence outdoors. By learning about the different types of polystyrene and how they are used, consumers are better equipped to make more informed purchases on future PS products. Polystyrene foam is perhaps the most common type of PS that individuals are familiar with. There are two primary types of PS foam, which include expanded polystyrene and extruded polystyrene, abbreviated as EPS and XPS respectively. EPS is more commonly used in everyday applications, such as in Styrofoam cups and in packing peanuts used in shipping. XPS is much more dense and durable, and it is used in larger applications such as in architectural models. According to the EPS Industry Alliance, Expanded polystyrene (EPS) is an innovative building material that lends itself to design flexibility for builders and the structural integrity of many building projects. Since the 1950s, EPS has been recognized as a mainstream insulation material, however over the past decade, new applications have rapidly developed. Now, EPS is a powerful design element and an ideal choice for green building design, offering tangible environmental advantages that can maximize energy efficiency, providing improved indoor environmental quality and enhancing durability. SIP, or structural insulated panels, are a composite building material. 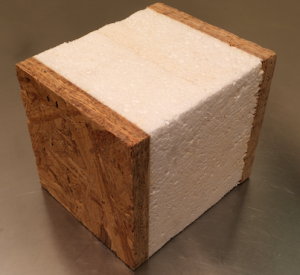 The core can be made from expanded polystyrene foam or extruded polystyrene foam. This type of polystyrene is often fairly brittle when it is developed, but it is highly impact resistant, especially when combined with other materials. As a result, this plastic is often used in protective applications, typically as windows and screens for electronic devices. Finally, the film is used in a variety of packaging purposes. Polystyrene film can often be vacuum formed, stretched out over a specific product and sealed in order to prevent air from leaking out or entering. For more information on polystyrene or to learn more about insulation, contact USI online to find a branch near you and get a free quote. USI believes in excellence in every step of the process and ensures timely completion and quality of service, time after time. ← What are blower door tests and why do they matter?